This "Historically Speaking" column was published in the Exeter News-Letter on Friday, January 30, 2015. Mary Taylor Gilman Gordon was not born in Exeter, but she was born to Exeter parents and moved to Exeter at a young age. Her career as teacher of the deaf at the institution that would become Gallaudet University would span 40 years. The daughter of Stephen Gordon and his second wife, Elizabeth Gilman, Mary was born in Berwick, Maine, on September 23rd, 1832. By the time her sister Ellen was born in 1837, the family had moved back to New Hampshire. Her father, Stephen, is listed in the 1839 Portsmouth directory as a ‘professor of music’. His death in 1842, left Elizabeth with two small daughters aged 9 and 4. She moved back to her hometown of Exeter and scraped by, somehow providing her daughters with a solid education in music. Both girls would eventually become music teachers. Mary is listed as ‘teacher of instrumental music’ in the catalog of the Exeter Female Academy in 1854. She travelled to Washington, D.C. in 1860, to teach at the fledgling Columbia Institution for the Deaf, Dumb and Blind, leaving Ellen and her mother behind in Exeter. What drew her there is a mystery, but the school did have some thin ties to New Hampshire. On the board of directors of the school was Chester, NH, native, Benjamin French – the half-brother of Exeter’s favorite judge, Henry Flagg French. Perhaps Judge French recommended Mary for the position. We do know that she was a frequent guest at Benjamin French’s home in the capital, where he worked in various government positions including congressional clerk and commissioner of public buildings. Mary had entered the field at a time when education for the deaf fractured into all-out civil war. There were two very reasonable philosophies battling it out for the best of all possible outcomes. On one side were the manualist teachers – led by Thomas Hopkins Gallaudet in the United States. These educators had discovered that the most effective way to teach the deaf was through the use of sign language, which by 1860, had grown into its own language. Early American educators viewed sign language as artistic, beautiful and natural. Its use, it was believed, brought the deaf closer to God and allowed them to also learn written English. Deaf children picked up sign very quickly and were able to communicate easily and fluently with their teachers and one another. But it was felt that sign language limited the deaf in a hearing world. Hearing parents found signing difficult to learn and gradually saw their deaf children linguistically drifting away. What was needed, they believed, was to teach the deaf to communicate in the hearing world. This philosophy, championed by Alexander Graham Bell and others, believed deaf children should be taught to lip-read, speak and function in spoken English to avoid the isolation that was perceived in signing-only education. The two camps had intractable differences, with each believing the other should be banned from the education of the deaf. Gordon became so proficient in teaching speech articulation that, in 1891, she moved into the teacher training (or Normal School) program to instruct new teachers. Whether she worried over the development, which is sometimes referred to as the ‘dark time of oral instruction,’ we do not know. At the time of the controversy no one thought to ask the Deaf community which system they preferred, and when it came to a head in the 20th century, the Deaf overwhelmingly preferred to sign – their own language. Mary, of course, was fluent in both. After her mother’s death in 1882, Mary brought her younger sister Ellen – herself a music teacher – to work at the school. She served as matron, managing the student’s boarding life, for 18 years. Both women retired in 1900, Mary ultimately having taught at the school for 40 years. It was teaching that drove her. “I never put the key in the lock of my school room door without a sensation of pleasure,” she once said. Mary visited Exeter often during her tenure in Washington. In one photo, she is seen happily with four friends – all of them seeming to be giggling over an inside joke just as neighbor Albert Buzell took the picture. A long-time member of Phillips Church, at the time of her death in 1911, she was remembered in Exeter as an extraordinary woman. She died in Washington, D.C., but was laid to rest in the Exeter Cemetery with her mother. 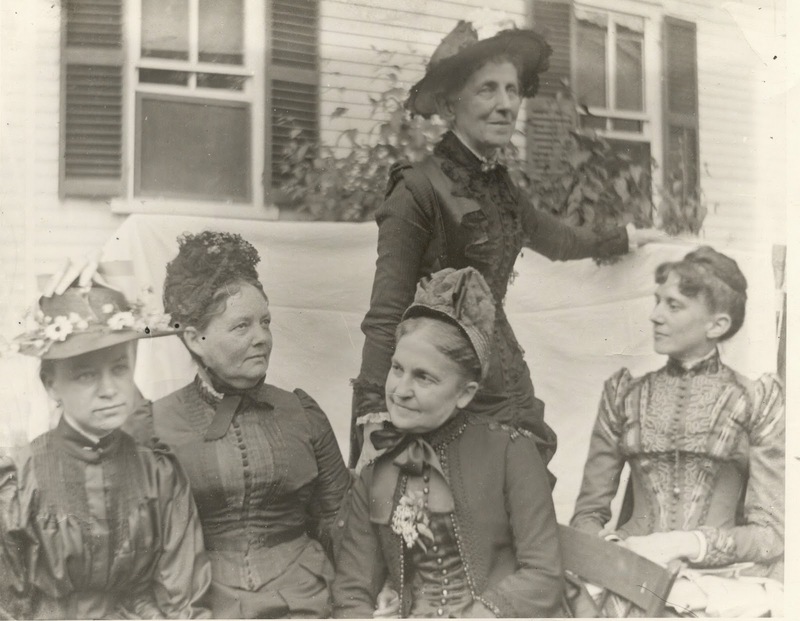 Photo: In this photo, taken in the early 1890s in Exeter by Albert Buzell, Mary Taylor Gilman Gordon (seated third from left with tilted head) and her friends, Ellen Wentworth, Sarah Chandler Perry, Eliza Bell (standing) and an unknown woman, seem amused with some unknown joke. Gordon was visiting Exeter during a brief vacation from her job teaching deaf students in Washington, D.C.